Hardcover, 10.5 x 16.5 in. / 48 pgs / 21 duotone. Located at 8,000 feet, 20 miles southwest of Salt Lake City in the Oquirrh Mountains, the Bingham Canyon copper mine is the largest manmade excavation in the world. More than half a mile deep, with a rim nearly three miles in width and a smelter stack only 35 feet shorter than the Empire State Building, Bingham has produced more copper than any mine in history. 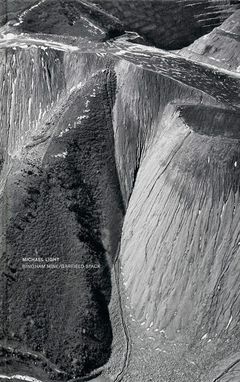 This volume presents San Francisco-based photographer Michael Light's series of breathtaking black-and-white aerial images of the Bingham Mine and Garfield Stack taken in the course of a single day. For the last several years, Light has become known for his aerial photos of the settled and unsettled areas of the American West, which reveal a fascination with geology, mapping and human impact on the land. These series have been published as limited edition, critically acclaimed artist's books; this is Light's first trade-edition release. Text by Rebecca Solnit, Lucy Lippard. FORMAT: Hbk, 10.5 x 16.5 in. / 48 pgs / 21 duotone.